All racing pigeons are ringed on one leg with life rings, each carrying an individual number which identifies the specific pigeon. 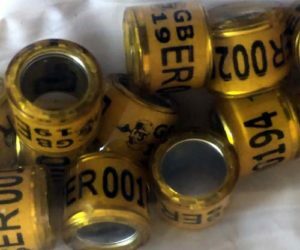 The RPRA supplies GB rings to its members. Should you find a stray racing pigeon you can enter the ring number in our Stray Reporting Wizard and receive the owner’s contact details. Alternatively, if you open the bird’s wing, you may find – stamped on one or more feathers – the name and address and/or telephone number of the owner. To work out the cost of buying rings we have provided a ring price calculator below. This shows the prices for GB19 original and show racer rings. You may order rings either by post with a cheque/postal order – on this form – or by phone using a debit/credit card: call The Reddings office (before 4pm) on 01452 713529. Rings are supplied in multiples of 20. Are you buying rings for a club?